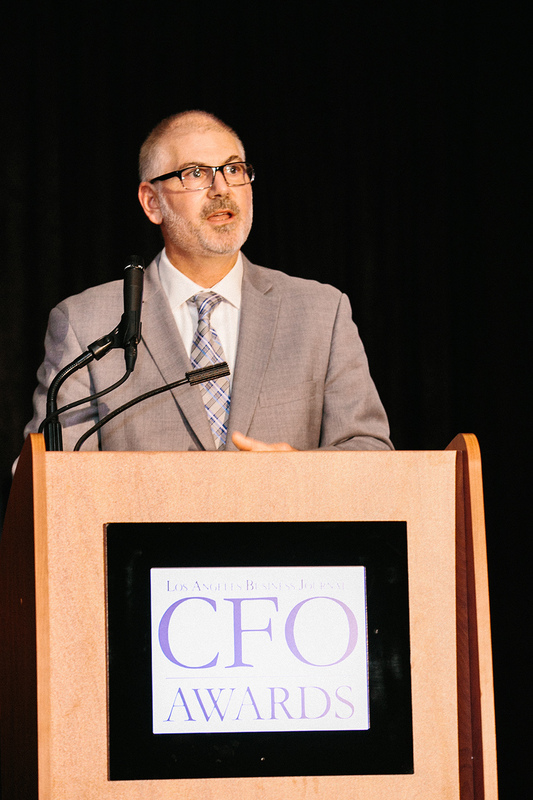 CSUN’s Vice President for Finance and Administration and Chief Financial Officer Colin Donahue received dual CFO of the Year, Government/Public Sector awards from the Los Angeles Business Journal and San Fernando Valley Business Journal. Photo courtesy Frances Iacuzzi. 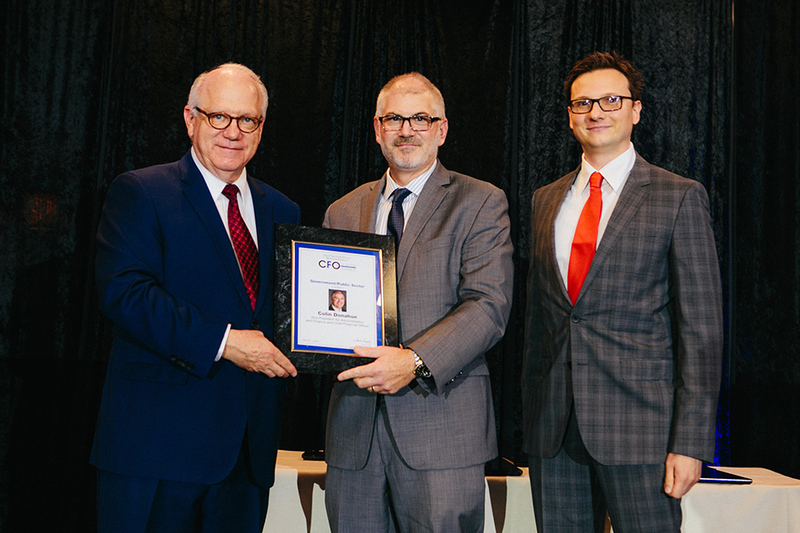 Donahue receiving the Los Angeles Business Journal CFO of the Year Government/Public Sector award. Photo courtesy Frances Iacuzzi. Donahue has spent more than two decades at CSUN and has seen the campus transformed. Here he holds the CFO of the Year Award Government/Public Sector from the San Fernando Valley Business Journal. Photo courtesy San Fernando Valley Business Journal. During his more than two-decade tenure at California State University, Northridge, Colin Donahue, CSUN’s Vice President for Finance and Administration and Chief Financial Officer, has helped provide the infrastructure, financial stability and strategic planning to enable the university to add 15,000 students and now serve nearly 40,000 students annually as one of the nation’s largest universities. 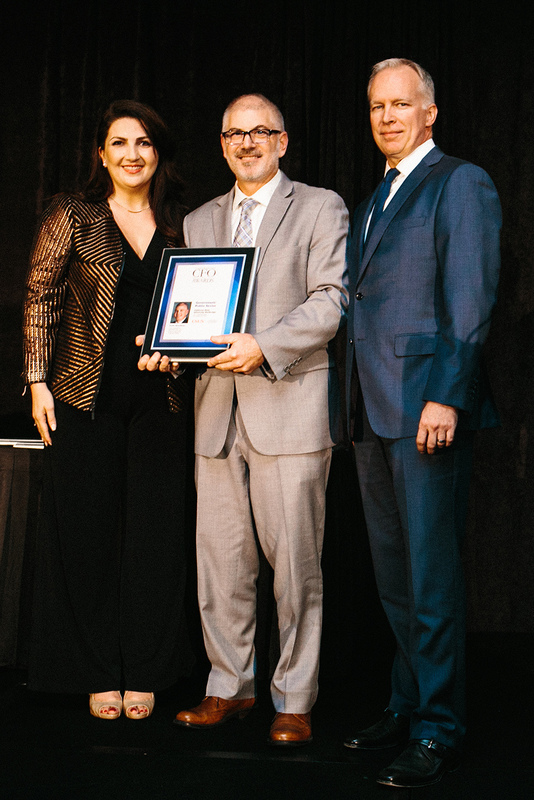 For his vital contributions to CSUN’s growth and reshaping of the campus landscape, both the Los Angeles Business Journal and San Fernando Valley Business Journal recently recognized Donahue as the Government/Public Sector CFO of the Year. Donahue came to CSUN in 1996 as the manager of construction services. During the intervening years, he took on increasing levels of responsibility and leadership. Today, he oversees CSUN’s budget planning and management; environmental health and safety; facilities management; financial services; human resources; internal audit; police services; parking; and risk management. Showing a bit of his trademark humility, Donahue pointed to the collegial environment at CSUN and shared praise with his colleagues and team members. Donahue in particular recognized colleagues Associate Vice President for Financial Services Deborah Wallace, Associate Vice President for Budget, Planning and Management Sharon Eichten, Associate Vice President for Human Resources Kristina de la Vega and Associate Vice President for Facilities, Development and Operations Ken Rosenthal and their respective teams. He also pointed to strong leadership and cross-divisional collaboration that occurs at CSUN. “I’m proud to be part of President Harrison’s cabinet,” Donahue said. “We have the appropriate level of creative tension in the areas of finance and budget. That allows us to have a robust, yet respectful dialogue. You have to have that. If you’re superficial, you sort of work around the edges, and the decisions that you make simply continue the status quo. You may achieve a few things that address priorities, but you never change the dynamic dramatically. As construction manager in the mid-1990s, the task ahead of Donahue was colossal following the 6.7 magnitude Northridge Earthquake. He worked in a tent during his first five years at CSUN, as the campus underwent its renaissance. By 2001, University Hall, the hub of campus administration, opened on the west side of campus. By then, Donahue was the director of facilities planning, design and construction. In 2005, he was promoted to associate vice president for facilities development and operations, and in 2013 Harrison appointed him to his current position. The buildings and facilities constructed or renovated during Donahue’s tenure are numerous — totaling more than $1 billion — but all reflect his attention to detail and commitment to fiscally responsible construction management. Highlights include the construction of the Valley Performing Arts Center, Student Recreation Center and the Extended University Commons, all projects that resulted in LEED Gold certification for sustainable building practices. In 2018, his team will oversee the groundbreaking on an innovative public-private partnership project with Jupiter Realty Company to develop a Hyatt Place Hotel at no cost to the university. The hotel will open along Nordhoff Street in 2019 adjacent to CSUN’s orange grove and Younes and Soraya Nazarian Center for the Performing Arts. Throughout his time at CSUN, Donahue said that student success has remained a constant focus. In addition to his work at CSUN, Donahue serves as chair of the California State University Chief Administrators and Business Officers (CABO) and is a member of the board of directors for New Horizons, a local social services agency for individuals with developmental disabilities. There he chairs the strategic planning committee and serves on the budget committee. He also serves on the Northridge Chamber of Commerce board of directors. Being named CFO of the Year by both publications gave Donahue a chance for reflection.